Enjoy Utah! 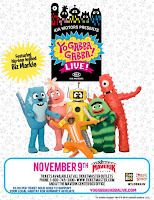 : WIN Yo Gabba Gabba Tickets! 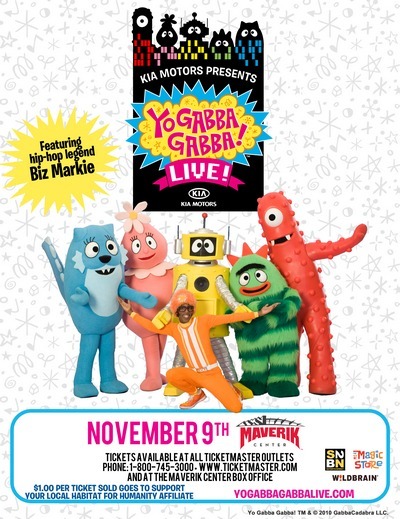 WIN Yo Gabba Gabba Tickets! Yo Gabba Gabba Live!There's A Party In My City! A FAMILY FOUR-PACK OF TICKETS!? I have four tickets to the 2:00pm showing on Tuesday November 9th. CONTEST CLOSED! The winner will be announced tomorrow on our blog! GOOD LUCK and thanks to all who entered! HOW TO PURCHASE TICKETS, AND DISCOUNT TICKETS ALSO! On Monday October 11th, there will be an announcement about purchasing tickets at a discount for members of the EClub of The Maverik Center. To become a member of the EClub, CLICK HERE. CLICK HERE to be taken to the official website of The Maverik Center to purchase tickets, or visit their box office located at The Maverik Center in West Valley City. West Valley City, UT - Fresh off a triumphant sold-out tour debut, a headlining performance at The White House, a critically-acclaimed, chart-topping album, and an appearance at Coachella that garnered rave reviews from spectators and media alike, DJ Lance Rock and the cast of YO GABBA GABBA! are heading back on the road with YO GABBA GABBA! LIVE! : THERE’S A PARTY IN MY CITY! to play to enthusiastic fans in West Valley City. Today’s hottest live show for families will be at the E Center on November 9 for two shows. YO GABBA GABBA! LIVE! : THERE’S A PARTY IN MY CITY! is produced by S2BN Entertainment in association with Wildbrain Entertainment and The Magic Store and promoted by United Concerts and Live Nation. Champions on the stage and in the community, the Gabba Gang will partner with Habitat for Humanity to further their homebuilding efforts. In addition, $1 from every ticket sold for YO GABBA GABBA! LIVE! : THERE’S A PARTY IN MY CITY! in West Valley City will be donated to the local Habitat for Humanity affiliate. Pre-sale tickets are available to American Express Cardmembers starting Thursday, May 20. The public on-sale will begin June 5 at 10 AM. A special GabbaTix pre-sale offer for members of the Gabba community will begin on Friday, May 28 at 10 AM. VIP packages with premium tickets and meet and greets will also be available. For complete tour, ticket information and VIP packages, visit www.yogabbagabbalive.com. Children under one year of age will be admitted free to sit on a parent’s lap. Released in October, 2009, YO GABBA GABBA! : MUSIC IS AWESOME Volume 1 topped kids and overall music charts at iTunes (#1 kids album), Amazon (top 5 kids album) and Target sales, which reached more than 40,000 copies in only 6 months since its release. YO GABBA GABBA! : MUSIC IS AWESOME was picked as one of 2009’s top holiday gifts for toddlers by both PARENTS magazine and the popular Mom web destination MomLogic.com. YO GABBA GABBA! : MUSIC IS AWESOME Volume 2 will be released on iTunes and will hit shelves nationwide this September. Dates, venues and ticket prices are subject to change. About S2BN Entertainment S2BN Entertainment is a diversified international family show and event entertainment company specializing in the acquisition, development and production of high caliber touring exhibitions, unique live music tours and events, theatrical performances, and consumer and multimedia product offerings. Our experienced management team executes activities across all types of global venues – from stadiums to theaters. S2BN Entertainment provides extraordinary experiences for our clients and our customers. Yo Gabba Gabba! premiered in the U.S. on Nickelodeon in August, 2007 and currently ranks as one of the most popular children series on television. Yo Gabba Gabba!, was voted as one of the best new shows on television by TIME magazine, won a BAFTA Award in 2008, was awarded the “Outstanding Achievement in Children’s Television” Award by the Television Critics Association, and is a two-time Emmy nominee. The series airs three times a day, seven days a week on Nick Jr. and in several major international territories, including Australia, Canada, Israel, Latin America, New Zealand, South Africa and the U.K.
Yo Gabba Gabba! infuses retro-style and beat-driven music to teach simple life lessons through music. The series stars DJ Lance Rock (Lance Robertson) and a cast of colorful characters, including: Brobee, the little green one, Foofa, the pink flower bubble, Muno, the red Cyclops, Toodee, the blue cat-dragon and Plex, the yellow robot. Today’s most popular names in movies, television, music and sports flock to guest star in the groundbreaking show, including Jack Black, Rachel Dratch, Melora Hardin, Tony Hawk, Biz Markie, Jack McBrayer, MGMT, Mark Mothersbaugh, The Roots, Andy Samberg, Amy Sedaris, The Shins, Amare Stoudemire, The Ting Tings, Jimmy Eat World and Elijah Wood, among others. Yo Gabba Gabba! toys, apparel and other merchandise are sold in stores nationwide in the U.S. and have skyrocketed in popularity. Yo Gabba Gabba! is recommended as a trusted program for preschoolers by The Smart Television Alliance, a non-profit organization comprised of leading non-profit children’s media organizations including Common Sense Media, Parents’ Choice Foundation, Parents Television Council and Coalition for Quality children’s Media: KIDS FIRST!. Visit www.yogabbagabba.com. W!ldbrain is an award-winning entertainment company and one of the world’s foremost producers of animation. The studio develops and produces television, motion pictures, short-form programming, commercial content and licensed merchandise. W!ldbrain has produced an exceptional slate of programming, including the critically acclaimed television series Yo Gabba Gabba! (Nick Jr.) and the live touring show Yo Gabba Gabba! : There’s A Party in My City! ; The Ricky Gervais Show (HBO) and the hit Disney series, Higglytown Heroes. Some upcoming television and short-form projects include Bubble Guppies, an animated series for Nick Jr., The Hard Times of RJ Berger, an animated series for MTV and Team Smithereen, the short-form stunt puppet show from Dan Clark. W!ldbrain and its creative team have won top industry awards. In film, the studio won an Annie for its computer graphics short film, Hubert’s Brain. W!ldbrain has received Clios, Addys, BDA Awards and Annies for their commercial work, reinvigorating classic brands for leading companies including The Coca-Cola Company, Honda, Kraft and Nike and has gained national attention for their animation work on behalf of Esurance, Ubisoft and Virgin America. W!ldbrain’s sister company, Kidrobot, creates limited edition toys, clothing, artwork and books, with stores in New York City, Los Angeles, San Francisco and Miami. W!ldbrain is based in Los Angeles, CA. www.wildbrain.com. The E Center of West Valley City opened its doors to the Salt Lake Valley September 22, 1997. Designed by the world's premiere arena architect, HOK, The E Center is the home of the ECHL's Utah Grizzlies. The E Center gained international acclaim and exposure as the host venue for the Ice Hockey Championships at the 2002 Olympic Winter Games. The E Center combines the modern amenities of a large arena with the service and intimacy of a small theater. Within the E Center is a unique theatre configuration which can accommodate audiences as small as 3,700, while a crowd of 12,000 can be just as comfortable in the main arena. In addition to family shows and sporting events, the E Center is a leading entertainment venue hosting nationally known concert acts such as Michael Buble, Elton John, Neil Diamond, Sarah McLachlan, Mannheim Steamroller Orchestra, Dave Matthews Band, The American Idols Tour, The Jonas Brothers, Gwen Stefani, Linkin Park and many more. The E Center has also been home to family shows such as Sesame Street Live, The Wiggles, Bob the Builder, Dragon Tales Live, Thomas and Friends Live! On Stage A Circus Comes To Town, The Steel Thunder Tour, Arenacross and nationally televised productions of Holiday Festival on Ice and World Wrestling Entertainment's Smackdown Live. The E Center is managed by Centennial Management Group, Inc., and is committed to providing high quality management services to arenas, amphitheaters, stadiums and convention centers nationwide. This is Lynda Ostler, I have friended Squawkbox and Gines and I am already on your FB and blog. YAY! Got all entered. Here's for Sherry!